The alarm goes off at 6am. Or maybe 5am. You reach over in a semi-conscious state to shut it off and let your arm fall back on the bed, rolling over, hoping for few more minutes of rest. The day begins with hot coffee and the latest news on your phone. You start answering emails before you get in your car. Maybe you work a conference call in while you’re sitting in traffic. By the time you reach your office, the world is abuzz and you have five minutes to make it to the morning meeting. Is this any way to live your life? One decision made on a whim transformed my life…and keeps transforming my life. She came to Ecuador to experience a new culture and in doing so challenge all her beliefs about the way her life should be. She came to discover a person who had been there all along but had never been able to emerge. The time was not right…until now. 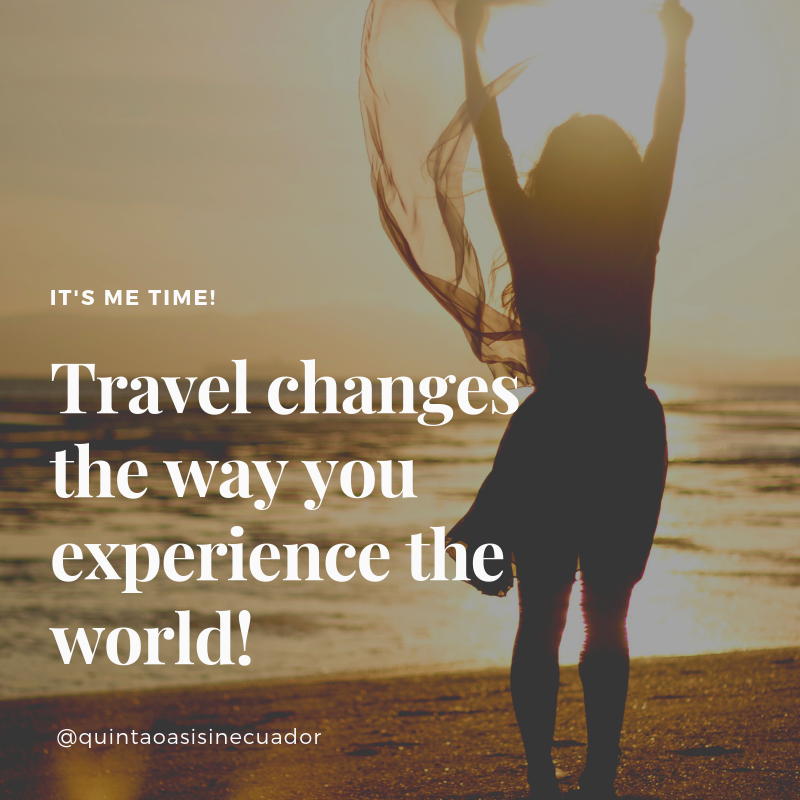 The inkling that there was something undefined that needed its own expression set her off on a three-month journey through South America, living with indigenous people in Peru, dancing salsa in Colombia and coming to reflect, relax and renew here at Quinta Oasis in Ecuador. This experience of opening oneself up to something unknown, to cultures that are unfamiliar, and to challenge one’s own concept of what one is capable of is what transformational travel is all about. At Quinta Oasis we call this Intentional Travel. People come here not only to experience the culture but with a strong intention to dive deeper into the meaning of their lives, to explore new possibilities without the pressure of old beliefs and assumptions or the limitations of a schedule and responsibilities. With a specific intention we create a custom retreat experience that blends mindfulness and consciousness with experiences that inspire. Here the heart and mind engage with body and spirit to resolve old issues and create new possibilities. According to Michael Bennett, there is a method to traveling with intention, outlined by the Transformational Travel Council as seven types of travel experiences. Travel with purpose or feel the call to adventure. Seek something new, different, and better in life even if you don’t know really know what that may be. Travel with a sense of openness. Being open-minded and open-hearted allows you to truly engage with the experiences, people, and places in a much deeper and more meaningful way. Cross the threshold of adventure into a zone unknown. This can lead to a critical psychological disconnection from the ordinary world and routine at home and can open up channels of creativity and imagination and freedom. Take on cultural and physical challenges. Push your comfort zone and see how resilient, resourceful, and powerful you are. Engage in meaningful conversations. Listen without judgment and share thoughts, ideas, perspectives, and life stories. Reflect on your experiences. This can be accomplished through journaling, prayer, meditation, art, or some combination of the above. Find time to make sense of what you are seeing, doing, and experiencing. Process it all and explore how you might be able to apply what you learn to your life. Take intentional action beyond the actual trip. When you get home, make desired changes in your life inspired by shifts that took place on your journey. Purposefully design what you want in life. The idea of “transformative travel” is taking hold across all segments of the industry and catching the imagination of travelers of all stripes. A survey conducted by Skift in 2017 found that this was a growing trend among travelers. In the survey of 1,350 travelers, 54 percent of respondents ranked the importance of transformative travel as 7 out of 10 or higher and 52 percent said they place increasing value on this type of travel. With our Custom Personal Retreats we meet all seven of these elements. Before we even knew about Transformational Travel as a trend, we designed our personal retreats knowing that people needed a sanctuary to consciously shift the dynamics of their lives and bring real change home with them. It’s time for you to pause.